Giving you the support, skills and confidence to make the changes necessary to achieve what you want out of life and business. In our experience, maintaining management and partners in ExecutiveLink™ is the most cost effective method of keeping a flat management structure and addressing the human and strategic issues in a business. ExecutiveLink™ encourages a continuous improvement structure and quality control to ongoing management. ExecutiveLink™ is based on two truths. First, it is easier to see someone else’s problem than it is your own. Second, good intentions aren’t enough. People move further faster when they are held accountable to produce results. ExecutiveLink™ provides structure, support, objective analysis and the accountability it takes to be successful at management. Corporate staff can be teamed with other members of the corporation if there are five or six managers. They can otherwise be teamed with other suitable businesses in a peer advisory board. The advisory boards meet three times a year in a facilitated meeting to review each member business. The ExecutiveLink™ program also includes an outstanding continuing education program designed to challenge thinking and keep people developing. 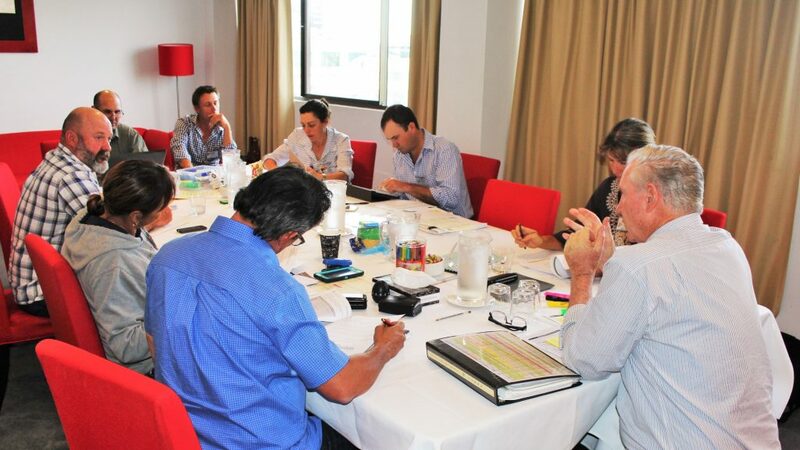 When Stan and Terry started teaching GrazingforProfit™ Schools in Australia it quickly became evident it was not possible with the rapid growth in graduate numbers, to provide the support needed to each business on a one-on-one basis. ExecutiveLink™ was conceived in 1992 as way of providing technical and peer support for the often-difficult changes that are required. An added advantage turned out to be the peer pressure, which is also important to overcome procrastination. It took three years to work out how to make it fully effective and ExecutiveLink™ passed its 21st birthday in 2013. Today ExecutiveLink™ operates in Australia, Africa and the USA as a unique professional development program for rural people. It provides the structure to work together on respective businesses to be economically, socially and ecologically successful. Let’s look at the reality of Australian Agriculture today. Business as usual isn’t working. Debt levels, increasing input costs and general expenses just aren’t being balanced by an increase in income and production. For this very reason, what was profitable in years gone by, unfortunately, is not necessarily going to be profitable today. A new approach needs to be taken to new circumstances, to challenge and develop a business to a point where it has the efficiency and production to not only survive, but to grow for future generations. Despite this ever tightening cost price squeeze, there are professional managers in this industry making money. The answer lies in what I term ‘professional management’. Regardless of what a business looks like now, there is always improvement to make. To take advantage of the opportunities we are presented with, we need the skills, support, network and accountability of a professional manager to fully capitalise on them. After working with thousands of people in this industry, we have designed and refined over 21 years, a process that provides both peer support and pressure to make the changes that we can so easily put off. The process helps redefine what we want, and to take control of, and responsibility for, our personal and business outcomes. In doing so, we become professional managers. This process is ExecutiveLink™. It is not possible to predict the outcomes from an ExecutiveLink™ journey. However, ExecutiveLink™ members are always in a different place when they graduate from the program by being in control of the important things in their lives. It’s not an easy road, but one where the rewards are more than worth the effort that it takes. I am proud to say that there is no doubt that ExecutiveLink™ is the greatest support service that RCS has developed for rural businesses. I hope that you will join me for an experience that will change your life forever. ExecutiveLink™ provides the circuit breaker to ensure the relevant stuff in GrazingforProfit™ and other RCS Short Courses get implemented. Imagine having somebody to hold your hand and walk you step-by-step through the process of mastering your own accounts and analysing your business. Together with your own coach, discover how to break through the monotony of book-keeping for the tax man and produce a set of meaningful financial management accounts that allows you to make important decisions based on fact and absolute understanding of financial literacy. This is the beginning of the journey to become comfortable with business numbers. Getting the fundamentals right is essential. Once you get the foundations right, the rest becomes exciting. Now that you’ve got the basics cemented in, you will have a team of people completely invested and 100% interested in you succeeding. Experience where you are now in your life, envision exactly where you want to be, and learn how to close the gap between the two. This stage unearths the key areas to increase knowledge and take action. Develop a clear target of what you want in your life and why – in your work, your finances and your relationships as well as make fundamental decisions, build a plan and create strategies for sustained momentum towards these targets. We get as much if not more knowledge and experience by working with the other members of our board than we do by working on our own business. Those who create an extraordinary life and achieve their highest vision share one fundamental power: the capacity to turn their fears and limitations into positively focused action. There is a time when ExecutiveLink™ moves from dealing with current issues to focusing on the future. With constant work on your vision and goals, along with the development of a comprehensive, active business plan, you will determine the road map by which you can walk into the future of your dreams. What is included in the ExecutiveLink™ program? Your very own Board of Directors Meeting three times a year as a reciprocal board of directors for each other’s business, this no-nonsense program helps you as managers and owners achieve what you want out of life and your business. Guest speakers With a mixture of both national and international speakers, each meeting you’ll feel motivated and up-to-date with what is cutting edge information and ideas from a wide range of guest speakers. Business analysis and benchmarking with RCS Profit Probe See how you are performing compared to the rest of your industry. This is a great way to see what the top 20% are doing and then dig down and pinpoint how to move your business towards the top. Lifetime access to RCS vault of models and tools This alone is worth the value of the entire program – with over three decades of consulting knowledge behind these models and tools, we cannot place a value on the work that has gone into these. Annual Business Audit Each year we will take you through the RCS “Gap Analysis” that will identify the strengths and weaknesses in your business. This is also a great way to monitor your progress and track performance. Business Plan This active document clearly outlines what you do, how and why. Having a working, active business plan allows knowledge to be taken out of your head and put on paper so that your partners and family can use if for generations to come.